Does not overdry rodent tender skin. Provides hair shine and nice herbal odor. Due to specially selected components, the shampoo provides tender care about pelage and skin of ornamental and pigmy rabbits, guinea pigs, rats, hamsters, ground squirrels, marmots, jerboas, squirrels, chipmunks, chinchillas, especially in ones with tender sensitive skin. Shampoo contains neither flavorings nor colorants. Aloe extract prevents hair breaking and double hair shaft, revitalizes. Allantoin reduces irritation, provides healing of small fissures and wounds. 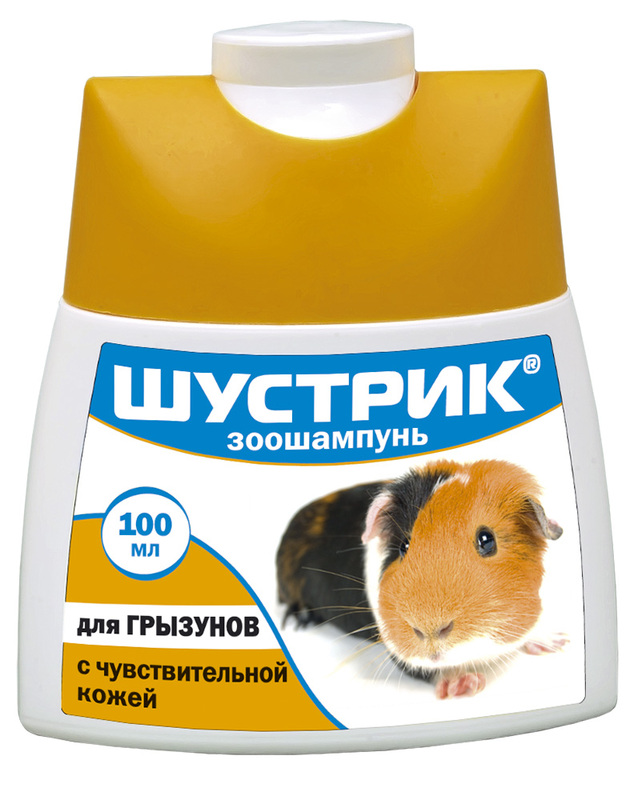 For regular care about rodent pelage and skin, especially in ones with sensitive skin. Moisten animal hair with warm water and apply shampoo dissolved in water (1:5), gently rub it until foam appears. In 1-2 minutes wash shampoo away with warm water and dry hair. In severe cases repeat the procedure.